If you’re building a new home or renovating your existing one, you’re likely juggling with how you can add more functionality and beauty. When working in a bathroom, one of the best ways to refresh the space is with a shower revamp. The shower is a large enough space to make a design difference and small enough to not overwhelm the bathroom. 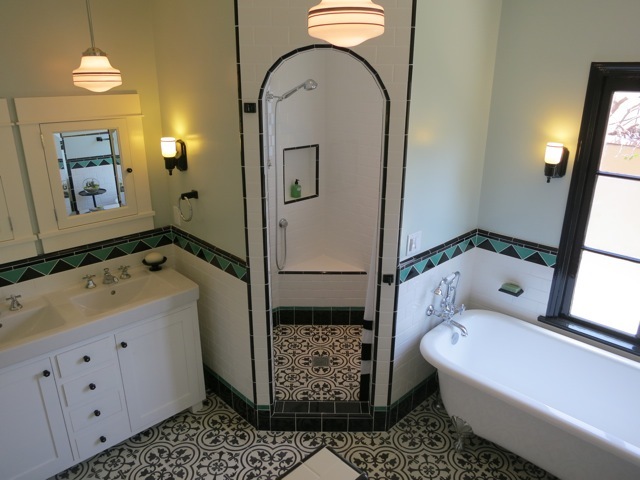 Create a focal point in your bathroom that is also functional with cement tile. 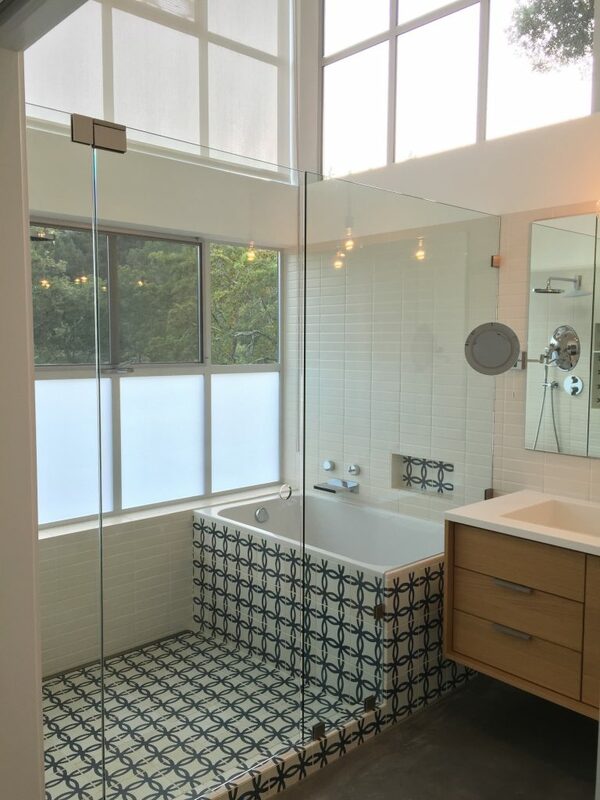 As the best tile for showers, cement tile offers a wide range of benefits for this space. 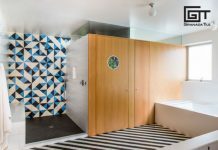 Learn what they are in this article, discover the important qualities and practices to consider, and why Granada Tile’s cement tiles are the best for your shower refresh. 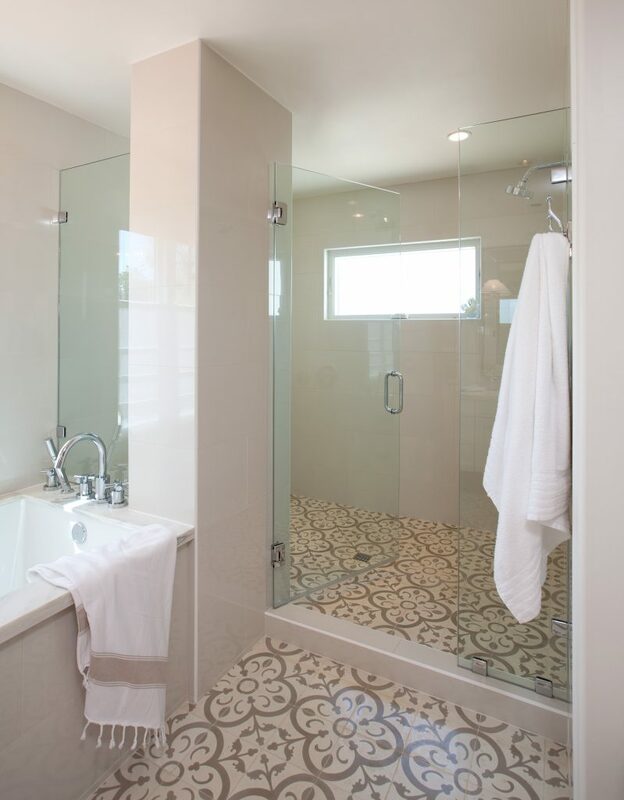 When compared to ceramic, glass or stone tile, cement tile are the best tiles for showers. Ceramic tiles tend to be less durable, glass tiles become very slippery when wet, and natural stone is absorbent and will be damaged over time. You want a tile that holds up in the moisture-heavy space and doesn’t pose a threat to you and your family. Let’s go into detail and learn about qualities to look for in tile appropriate for damp and wet spaces. Ensuring your cement shower tiles are properly sealed will help prevent any water from absorbing into the tile and damaging it. It will also ensure that the tile coloration and design aren’t affected. Ask your tile installer to apply a penetrating sealer before and after grouting, to prevent stains from the installation process and grout application. Sealing will also help prevent efflorescence, which is the appearance of a white substance on the tile surface when moisture passes through it, evaporates and leaves the activated lime behind on the surface. Tiles have a rating for how slip-resistant they are, according to the force needed to start two surfaces sliding. This rating is called the Dynamic Coefficient of Friction (DCOF). According to modern DCOF AcuTest results, receiving higher than a 0.42 DCOF rating on level surfaces means there is a high slip resistance potential and therefore a low probability of slipping. The total average DCOF rating for Granada Tile is 0.73. Outdoor showers are fun and practical when warm weather leads to sandy, salty skin and pool time. Only use cement tiles in your outdoor shower if you live in a warm climate without freeze-thaw cycles as the fluctuating temperatures can damage cement tile. Granada Tile’s quality cement tiles are the very best tiles for showers because not only are they incredibly well made using traditional methods, but they also look stunning and showcase the artisan quality only a handmade product can provide. 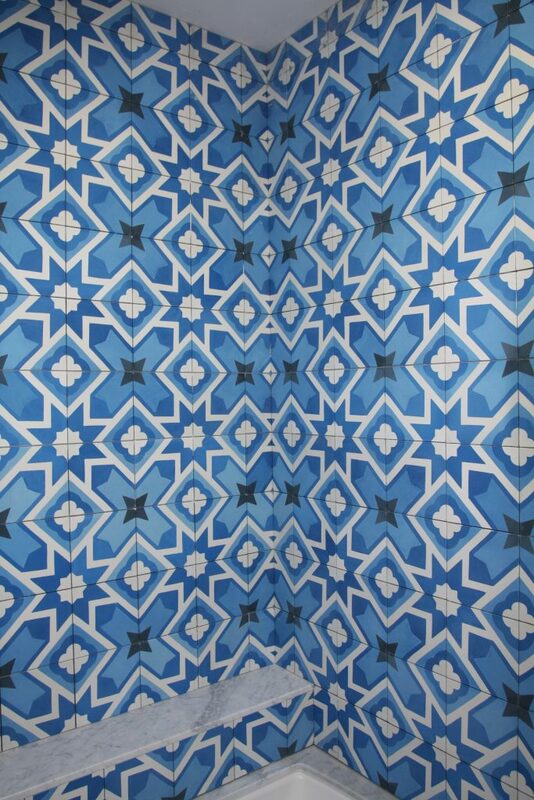 Cement tiles are the best tile for showers because they can stand up to the conditions of a shower while being stylish. Get inspired by these top design ideas. 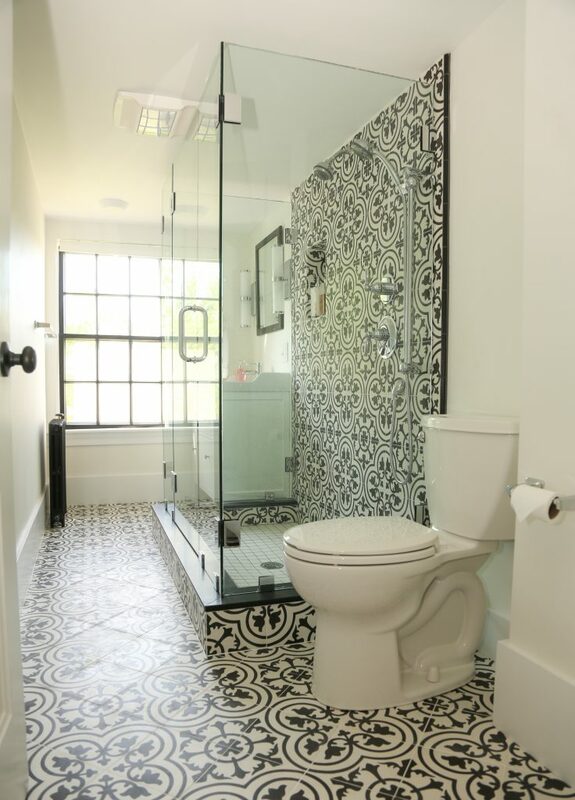 Black and white patterned tiles will never go out of style and pack a big punch in a bathroom. Extend a black and white bathroom floor to the shower or use your shower space as a feature. 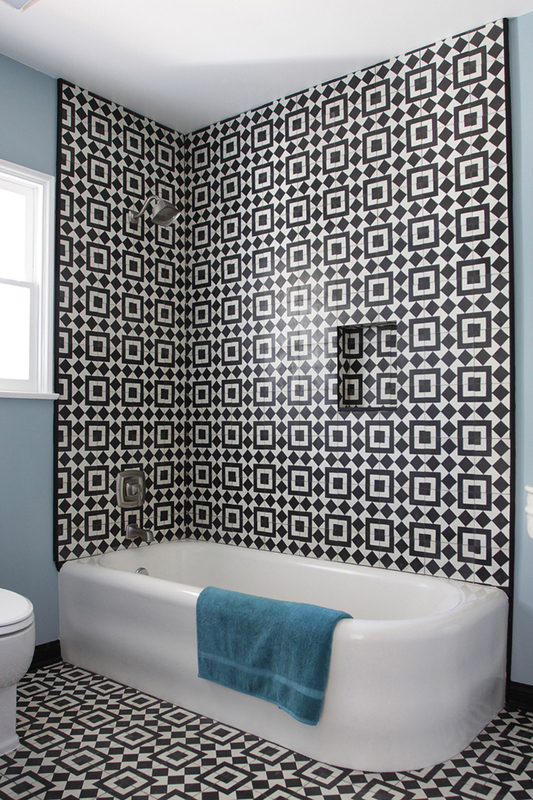 You can choose a more traditional design or go bold with a geometric pattern. Choosing light shades of white and gray will help make a bathroom look bigger and more inviting. This color combination is also very sophisticated and creates a high-end spa-like atmosphere. 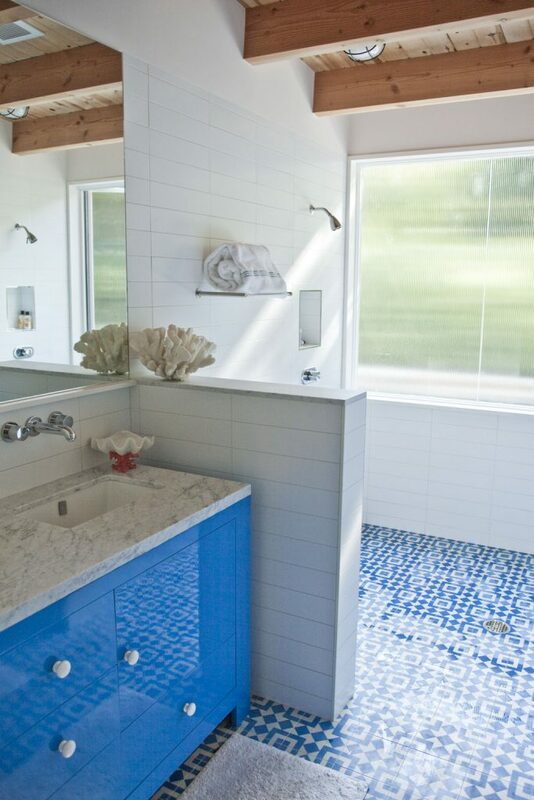 You can never go wrong with blue in a bathroom. 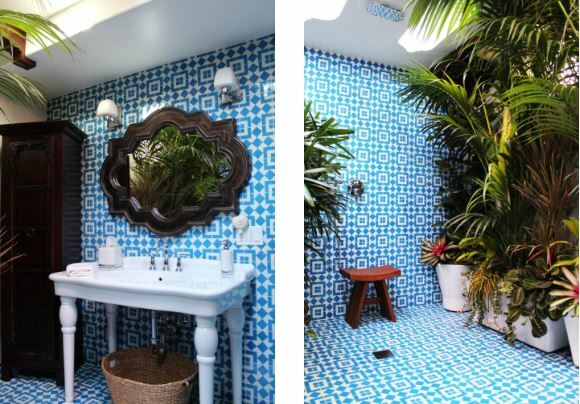 Using blue cement tile in a shower is the perfect place to add some pop. Complementary shades of yellow, gold and other warm hues enhance the blue tones. 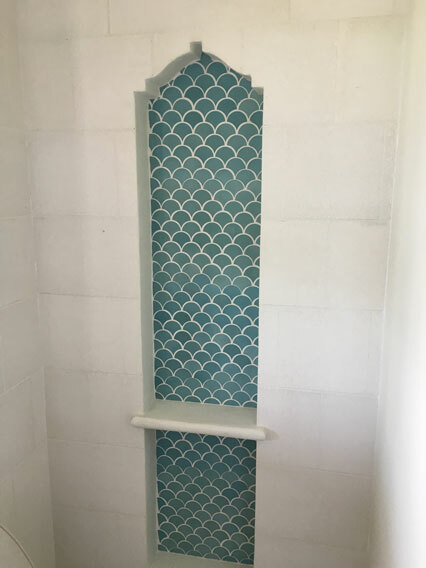 The scalloped fish scale tile is undeniably fun for a bathroom. Use this tile to make a splash in the shower, on the floor, walls or in a unique cut-out. 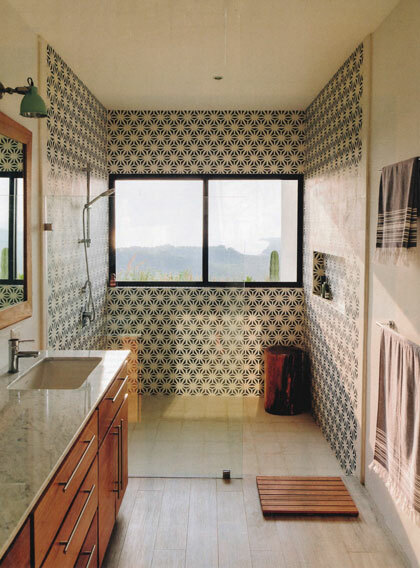 View our Bathroom Gallery for more shower tile inspiration. At Granada Tile, we recommend that your tile installer buffs your tiles with a white pad after sealing. Be sure to ask to keep the polishing to a minimum. It will help prevent creating a slick surface. A penetrating sealer absorbs into tile without sitting on the surface. Applying a penetrating sealer before and after grouting will help prevent any water from seeping into the tile, without making the tile slippery. A larger tile (larger than mosaic tiles) will help reduce your cleaning time. Smaller tiles create more grout lines and extra slip-resistance. Use a smaller tile on the shower floor and a larger tile on the walls. If you have sloped seating in the shower, choose a smaller tile for that component since smaller tiles handle curves better and require fewer cuts. Consider the shower a space that can be used as a feature wall or focal point. 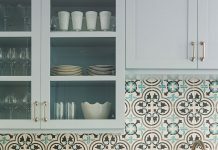 Allow yourself to have fun with unique tile designs in vibrant colors. If you’d like your shower to match the rest of the bathroom tile but want a feature, use a small area like a soap shelf or bench to add visual interest with a second tile design. Granada Tile cement tile win the award for being the best tiles for showers while adding unmatched style. Incorporate beauty and function in your bathroom when you install a Granada tile design in your shower. 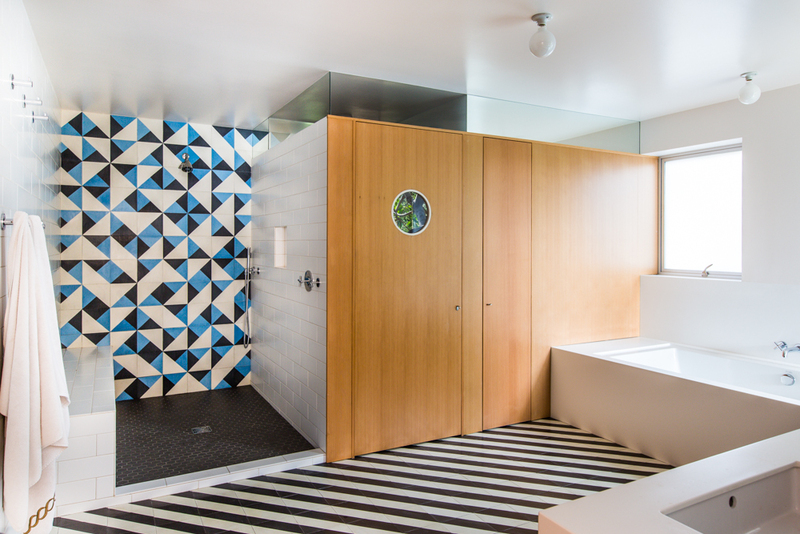 Find the perfect design and color tile for your shower. Check out our in-stock tiles and collections or contact our team to find out how you can create your own one-of-a-kind design.